If self-employment is just a ‘nice’ option for work, and if the business idea is simply an opportunity that doesn’t really connect with your heart, the chances for success are SLIM. This is why we have such dour stats on small biz success. Yet when folks truly believe that they require self-employment in order to live out their beliefs, and if the idea has some connection to their values…success is highly probable! This is why we see folks with mediocre ideas and little thought to business plans and financial projections succeed anyway and put all the Harvard MBA students to shame. Thus why we start the curriculum in Free Agent Academy with our ‘Calling’ course, led by Gary Barkalow of The Noble Heart. He is the maestro of ‘calling.’ It’s deep, faith based and fully touchy-feely. You can question what that has to do with having a business that successfully sells tamales (as an example of a guy I know), or trust we aren’t doing this for no reason… Anyone remember Mr. Miyagi? 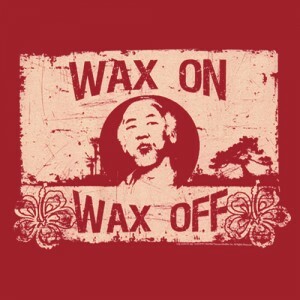 “Wax on, wax off.” Not till later, did ‘Daniel-san’ realize the value. When Free Agent Academy members complete the Calling course curriculum, they fill out a ‘Graduation Assignment.’ Gary Barkalow and I review these together. This week we have SEVEN (but only got through six) to review. We decided to open the class to the public. 1. What are the defining moments in your life? 2. What is the artistry, love, passion, curiosity that was present in your youth? 3. What desires are you aware of at this point in your life? Which one(s) would fall into each of these categories? 4. How would you describe your glory (brilliance, weightiness, splendor, strength, beauty, abundance) or your effect? In other words, what are you compelled to do in every situation? Articulate this in terms of 3 to 6 words. 5. God is always developing our Strength of Heart as He is revealing the Desires of Our Heart. What aspect of your character is He working on right now? 6. How is God wanting you to re-align your life with what He has shown you concerning your desires and your character?